Celtic's ambitions of a third successive Champions League campaign foundered as they crashed to a 2-0 defeat by Legia Warsaw at Murrayfield. While they still have a chance of a Europa League run, the absence of Champions League football is a massive financial blow, to say nothing of the prestige that comes with playing in Europe's premier competition. Supporters, who had yet to see their squad strengthened over the summer, must now wait to see if a lack of Champions League football might now hasten the departure of Fraser Forster and Virgil van Dijk. And though the Premiership title should still be won comfortably, the prospect of a campaign without the Champions League already feels like something of an anti-climax. Most frustratingly for Celtic, their departure comes at the hands of a team lacking their recent European pedigree, yet who seemed far more comfortable on this stage over the two legs. Deila was critical of his players after the first leg but they seemed bereft of imagination as they tried to right the wrongs from Warsaw. 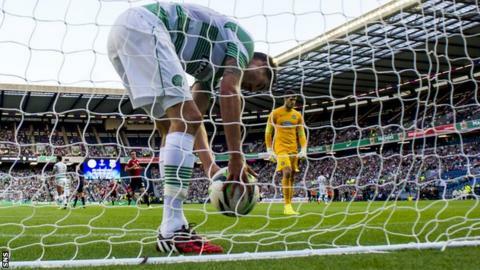 Instead, Legia hammered a further nail in their Champions League coffin before the break as they converted one of the few chances created in Edinburgh, where Celtic again played their home tie following their ground's involvement in the Glasgow 2014 Commonwealth Games. Kucharczyk slid a pass through the heart of the Celtic defence and Zyro held off a despairing challenge to slip the ball past Forster. A second-half onslaught failed to materialise and Legia seemed to be allowed to pass their way to goal at will before Kucharczyk rounded the keeper to score a second. Anthony Stokes and James Forrest did at least force Dusan Kuciak into good second-half saves but those efforts paled into insignificance in the grand scheme of things. By way of a crumb of consolation for Deila, both Lennon and Gordon Strachan failed to qualify for the Champions League in their first campaigns before going on to enjoy success. But the manner of this exit gives further ammunition to the sceptics who questioned the appointment of a man with no experience at this level. Match ends, Celtic 0, Legia Warsaw 2. Second Half ends, Celtic 0, Legia Warsaw 2. Substitution, Legia Warsaw. Bartosz Bereszynski replaces Michal Zyro. Substitution, Legia Warsaw. Helio Pinto replaces Ondrej Duda. Substitution, Legia Warsaw. Jakub Kosecki replaces Michal Kucharczyk. Substitution, Celtic. Teemu Pukki replaces Kris Commons. Substitution, Celtic. James Forrest replaces Anthony Stokes. Goal! Celtic 0, Legia Warsaw 2. Michal Kucharczyk (Legia Warsaw). Substitution, Celtic. Leigh Griffiths replaces Mikael Lustig. Miroslav Radovic (Legia Warsaw) is shown the yellow card. Virgil van Dijk (Celtic) is shown the yellow card. Second Half begins Celtic 0, Legia Warsaw 1. First Half ends, Celtic 0, Legia Warsaw 1. Goal! Celtic 0, Legia Warsaw 1. Michal Zyro (Legia Warsaw).